We have been helping customers receive the right size ring for over a decade & we can help you! First, place your order. If you would like a sizing ring to be shipped to you before we ship the ring you have chosen – include a note in the “Order Notes” on the shipping page during checkout and/or send a note to sales@simplywoodrings.com. You are also welcome to call us at 312-473-7940. 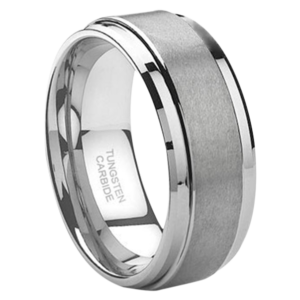 We will send you the S1000 gray tungsten sizing ring (pictured below), or if you prefer we will send you the same ring in black … the S1005. This service is free. You will receive the sizing ring apx. 3 days from the date you place your order. Try it on and let us know if it fits. We will then ship the ring you have ordered. All of our rings are “Comfort Fit”, once you wear a comfort fit ring you will feel the difference! And after a decade of experience, we have found that ring sizing charts/cut-outs/graphs typically do not work as well as an actual sizing ring. Alternatively, you can have your ring finger sized at a jewelry store before you place your order. Pictured above is the S1000 sizing ring in gray tungsten.